Sometimes all we really want from a recipe is a whisper of comfort from childhood. So, yesterday I did something I hadn’t done in a long time. 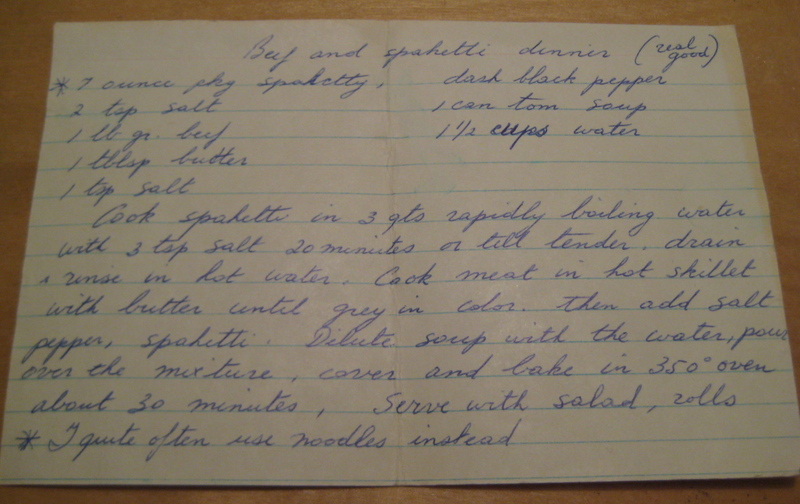 I turned to my yellow recipe box and found one of my mother’s classic dishes that she made not only for my brother and me when we were kids, but also for my children when they were young. 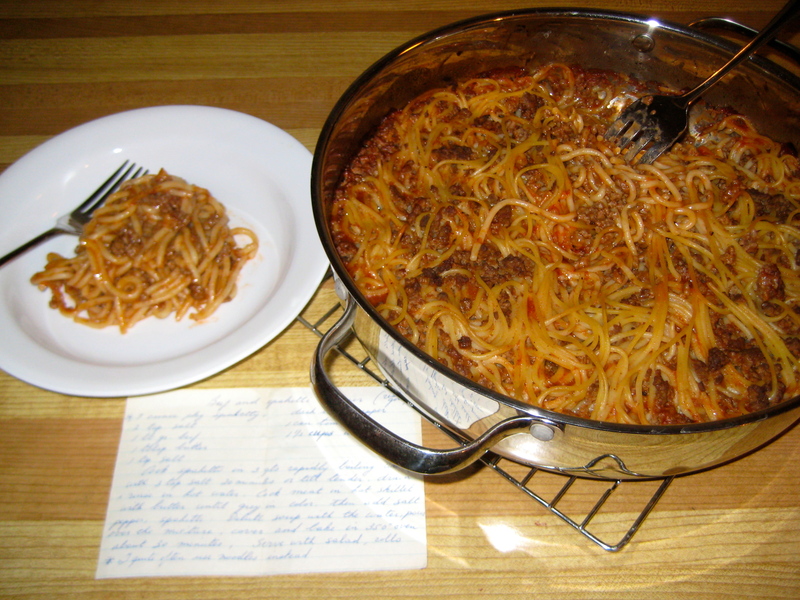 Her Beef and Spaghetti Dinner is “real good” – I know that not only from experience, but also because the recipe card she wrote out for me says so. This dish is nothing like my usual cooking style, but I wanted to be totally faithful to Mom’s recipe. I made it to help out my daughter by bringing a meal that her family could reheat and enjoy in between the demands of a newborn. The whole premise of the meal was to be simple, comforting and evocative of happy memories. Nourishment, after all, comes in many forms. 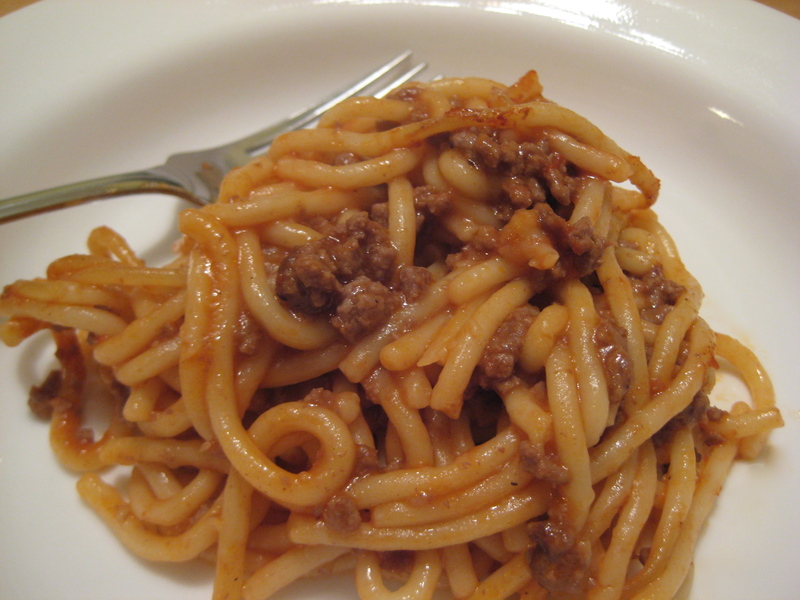 Although this dish uses spaghetti, it’s not remotely Italian food. The seasonings are limited to salt and pepper, and the flavouring comes from a can of tomato soup. A real classic casserole dish from the sixties. I haven’t made this in ages, and I was surprised to see that the recipe doesn’t even include onions. I gamely stuck to my intentions of not adjusting or enhancing the recipe in any way, other than using more spaghetti than it called for. (Let me tell you, that was a challenge!) I did update some of the cooking techniques; the recipe card actually suggests boiling the spaghetti for 20 minutes! Seems to me I’d have a pot of mush if I did that. The finished dish is a bit crispy around the edges, and tender in the centre. The flavour is mellow; no bright spices, herbs or tangy tomatoes. No flair, just a taste from childhood on the plate. Everyone needs a little comfort food now and then. Cook spaghetti in large pot of rapidly boiling water until al dente. Drain and rinse in hot water. Brown the beef in a hot skillet with the butter. Add salt, pepper, spaghetti. Dilute soup with the water, pour over the mixture and gently stir to avoid breaking the pasta. Cover and bake about 30 minutes. Then remove the lid and bake about 15 minutes more. That look so “stick to your ribs” Yummy!